Sea turtles, dolphin and fish…Oh my! Since January of 2017, there have been 30 sea turtle strandings in the Hilton Head Island/Bluffton area. Eight of these turtles were still alive and transported to the South Carolina Aquarium’s Sea Turtle Hospital in Charleston by the “Amberlance.” If you have not been to the South Carolina Aquarium, or it has been a while, you will find they opened a new exhibit on the main floor—a sea turtle hospital where you can see the patients through the glass! Currently, there are two Hilton Head Island sea turtles still in residence: Pearl, who was entangled in fishing line, and Crush, who ingested plastic. There were 325 sea turtle nests on Hilton Head Island beaches in 2017. The nesting sea turtles didn’t seem to mind that there were practically no dunes left after Hurricane Matthew. Unfortunately, the hatchlings noticed, and 32 nests were lost to beachfront lighting ordinance violations. (Remember, Lights Out May through October from 10 p.m.-6 a.m.) This number might have been reduced with a higher dune line to block beachfront lighting. 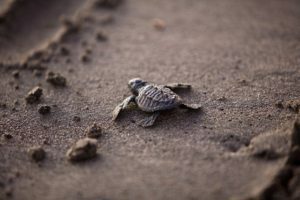 Tropical Storm Irma disrupted a beach fill project in Sea Pines on September 11, destroying the remaining 54 sea turtle nests still incubating on the beach. In other storm-related news, Irma’s high winds swept in some sea birds that are rarely seen near shore, including a Cory’s Shearwater. 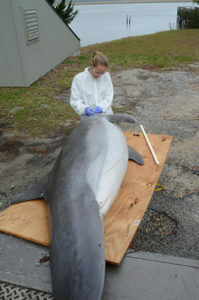 Fortunately, it was a relatively quiet year in the Lowcountry for dolphin strandings. In Beaufort County, there were only 10 strandings in 2017 (four of these in the Bluffton/Hilton Head area) compared to 15 in 2016 and 15 in 2015. We are happy to report that the dolphin UME (Unusual Mortality Event) of 2013/2014 has subsided and we seem to be back on track after a Morbillivirus episode. Dr. Eric Montie’s Marine Sensory and Neurobiology Lab at University of South Carolina Beaufort’s Department of Natural Sciences is conducting surveys to obtain high-resolution photographs of the dorsal fins of our local dolphin population. Every dorsal fin is different, like a fingerprint. A digital outline is applied to each image, and a computer system called DARWIN runs the outline through a recognition system that matches photos taken in the past. It can then be determined which of these are local bottlenose dolphin that stay in the saltmarsh estuary in the winter. To date, 256 dolphin have been individually documented and approximately 170 are local/permanent residents. In other words, almost half of our local dolphin population disperses in the winter. One pygmy sperm whale washed up on Daufuskie Island on August 18, 2017. Waddell Mariculture Center, despite major renovations, released two million juvenile red drum, spotted sea trout and cobia this year. The red drum were deposited in Winyah Bay and the ACE Basin, the spotted sea trout stocked Charleston waters and the cobia were released into the Port Royal Sound. All these fish from Waddell Mariculture Center can be tracked by DNA analysis. The 2016 moratorium on cobia fishing was extended and enhanced through January 1, 2018 because annual catch limits were exceeded in 2016. Cobia typically spawn in three areas on the Eastern Seaboard of the United States, one of which is under the Broad River Bridge in Beaufort County! At the University of South Carolina Beaufort, Dr. Eric Montie’s Marine Sensory and Neurobiology Lab is also studying the spawning behavior of red drum, silver perch, oyster toadfish, black drum and spotted sea trout with fish acoustics, utilizing recordings made from four data recorders stationed in the May River. It is fascinating to learn what environmental factors are affecting fish spawn. otherwise no additional closures have been reported (the headwaters of the May River are consistently closed to harvest). Oyster farming is gaining traction to lessen the demand on our wild population. Native oysters are typically harvested at two-years-old. Farm-raised oysters grow a bit faster because they don’t have to expend all that energy on reproduction. All oysters, whether triploid (farm-raised) or diploid (native), filter 50 gallons of water each day to keep our waterways healthy. Fiddler crabs are plentiful, scouring the surface of the mudflat at each low tide…and, thank goodness, the hydrogen sulfide gas is flowing from their burrows. It’s working! If you don’t know what I am talking about, you need to join a charter aboard Spartina in the spring. Blue crab populations seem to fluctuate above and below the 10-year average, but have never fully recovered from the drought of 1998-2002. 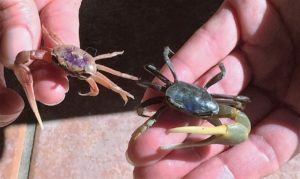 Blue crab populations are listed as overall below average on the South Carolina Department of Natural Resources website. I would be lying if I said I wasn’t concerned about the demand on our local blue crabs, but this crustacean population is recoverable. 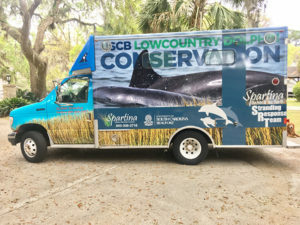 Special thanks to sponsors—Colleton River Plantation, Hilton Head Reef Foundation, Coastal Provisions Company, Beachside Tire and Auto and individuals—who have graciously donated in 2017 to the stranding effort, in collaboration with the University of South Carolina Beaufort Dolphin Conservation Program. Spartina Dolphin and Sea Turtle Stranding Response is a fund with the nonprofit Community Foundation of the Lowcountry. All donations are applied directly to costs associated with dolphin recovery and necropsy, injured sea turtle transport to the South Carolina Aquarium in Charleston and land/water recovery of sea turtles for documentation. Marine biologist Amber Kuehn is a fourth-generation Blufftonian and owner of Spartina Marine Education Charters. The manager of Hilton Head Island’s Sea Turtle Protection Project and known as the “Turtle Lady,” she has worked with sea turtles since 1998. In addition to turtle nest monitoring efforts, Kuehn coordinates the dolphin and sea turtle stranding response in Beaufort County and assists Dr. Eric Montie’s Marine Sensory & Neurobiology Lab at USCB in collecting dolphin data. For more information or to schedule a Voyage of Discovery next spring, call (843) 338-2716 or visit SpartinaCharters.com.